Since we homeschool we are asked many different parenting questions. Recently I was in a deep conversation with a friend. She was telling me how hard it was to get her children up in the morning for school. “Well, you don’t know, but it’s hard to drag them out of bed. Then we rush to throw breakfast at them as we run out the door” she explained. We don’t have to catch a bus or beat the first period bell, so she assumed my boys stay up late and wake up late. She was shocked to learn my boys went to bed earlier than her public school boys. 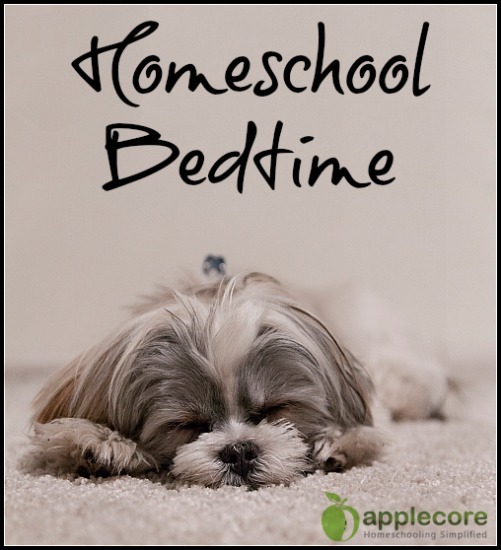 When is a good homeschool bedtime? As with almost everything … bedtime falls into the category of WWBFY. What Works Best For You. * If your children are miserable when they wake up – make them go to bed earlier. * If your children have a hard time falling asleep even after a long day of activity – let them stay up longer. * If your children are not exhausted by the end of the day – get them active to do something that will make them tired. Yes we homeschool, but my boys are expected to get up out of bed! We do not stay home so they can be lazy. We homeschool, but college is not forgiving. Jobs and bosses are not lenient toward laziness. I want to raise strong men of character, not happy nappers. Of course, if we travel or stay out late I allow my children to sleep-in and get rest. Even if they want to be cool and brag about a midnight bedtime, growing teenage boys need rest. Allowing your children to stay up later, sleep in longer, and neglecting responsibility is not a healthy option. It will eventually catch up. I am a wife. I want to have quiet time with my husband without the interruption of children. We have a rule that children are to be in bed with their lights out at least an hour before I go to bed myself. I like a nice quiet house before I turn off lights and go to bed myself. If you are looking to find the perfect bedtime try out different times. Keep in mind the daily activity and the attitude of how each child wakes up in the morning. Adjust little one’s bedtime by 15 minutes and older children by 30 minutes. Need help creating Healthy Bedtime Habits, check out my post at The Marathon Mom! Stef Layton started homeschooling in 2008. Her heart is set on intentional parenting and building strong family relationships. She is a columnist for Homeschooling Today Magazine. Should You Take a Winter Break?